Hi guys! I am sorry I have been missing in action lately. We are preparing to move in the next few weeks and it has me going a bit crazy! During these busy and stressful times, I have found it necessary to find something easy to make. Because I am a Vegan ordering in isn't always an option and it is not the best for you. I have found that chili is an awesome thing to make. It takes awhile to cook, but it is passive time. I can go and do other things, I do not need to sit over it the whole time. I have had this on it's own, over rice and over baked potatoes. All three are equally as delicious. 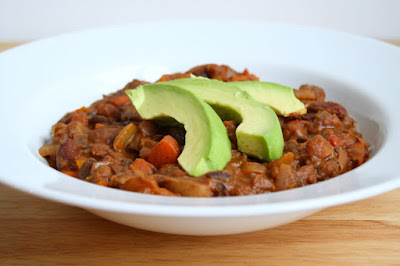 I also really enjoy topping it with avocado, it adds a certain creaminess I am used to having with my chili. In my "pre-vegan" days I would just add sour cream, avocado has the same effect without using dairy! 4. You can serve over rice, potatoes or on its own.